A geek goes walking – For the fainthearted . . .
Only a complete geek would think the bright sunshine of the first Saturday in August would present an opportunity to hike up onto the open moorland of Dartmoor to find delight in traces of the Haytor granite tramway. It was a transport back to happy memories of forty years ago. The final year at the secondary school, a few miles distant from the tramway, was spent in a leisurely manner. Having passed the examinations required to go on to sixth form college a year early, 1976-77 was passed doing things that were interesting – the three examinable subjects were English literature, world affairs in the 20th Century and environmental studies. Each had its own attractions, but at a remote school in rural Devon in the mid-70s access to literature and the stuff of world affairs was not easy, so environmental studies became a passion. There was no landscape or village that did not hide secrets that might be unearthed by someone who looked hard. To visitors, the Dartmoor National Park that surrounded our school was a place of unspoilt natural beauty, yet within a few steps of the roads that carried the coach parties there were granite hut circles that had formed the walls of houses in bronze age times, and there was a wealth of industrial archaeology telling the story of human industry over the centuries. It did not do to say it aloud, but human artefacts seemed far more interesting than natural history; flora and fauna had not the capacity to capture the imagination in the way that the ruins of a village, or the last traces of a tin mine, might. 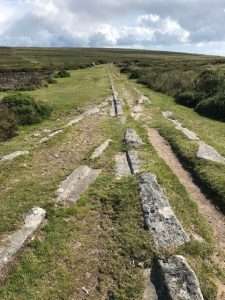 The most interesting features were always those that were unexpected, or quirky – those things like the Haytor granite tramway. 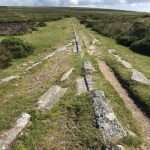 The granite tramway was first encountered on a Sunday afternoon hike across the moor in that everlasting summer of 1976; it seemed extraordinary that anyone would consider building a tramway in granite, and even more extraordinary that anyone would build a tramway from the heights of Dartmoor down to the Stover Canal, a drop of 1,300 feet. In Bradshaw’s Canals and Navigable Rivers of England and Wales, the details shown of the Stover Canal list the locks required to navigate its 1.7 mile length. If one wished to transport stone from Haytor quarries, how long might have taken for a consignment to reach its destination? The tramway down to the canal, the barges down the canal and then the River Teign to the quay at Teignmouth, the unloading of the stone before it was loaded onto sailing ships to be transported around the country – how long did it all take? How many people were involved in such a process? Perhaps somewhere there is research detailing how long it took a block of Haytor granite to reach the capital for the building of London Bridge in 1831. Asking the sort of question that might have surrounded the topics covered by environmental studies might have allowed the subject to fill the entire year. Standing at a junction of the tramway on an August Saturday, it was almost possible to hear the shouts of the men urging on the horses.